We have listed below some of the most frequently asked questions, as well as brief answers to them. We hope they will help you get to know us and the specialised treatments we offer. Yes, new patients are welcome and we value referrals from existing customers, their families and friends. Patients have given us the compliment of referring family and friends to Comfy Dental Mandurah. Our reputation for excellent dental care depends on two things: our good work and your beautiful smile! Your confidence in our care motivates us to continue to strive for excellence. Thank you for your referrals. Your trust and support are greatly appreciated. Many people are uncomfortable with visiting the dentist. Your comfort is our highest priority, and our office is designed so that you can enjoy a relaxing dental visit. Please talk to the Dentist if you have concerns. There is a lot of information that we need to take into account to provide an accurate cost for you. Each patient will have a variety of treatment options and technical requirements using a variety of materials and components. However, during your initial consultation, all costs will be explained and any proposed treatment will also be accompanied by an itemised estimate. Payment in full is required on the day of treatment. We offer several payment options for your convenience. We accept Cash, Debit card, Credit Card, and American Express. If you have any questions regarding your account, please contact us. Do you accept my health fund? We offer on the spot claiming (HICAPS) for all major Health Funds. You do not have to wait in a long queue to claim your benefits. A swipe of your fund card pays the benefit to us electronically and you will know immediately the balance still payable. If your fund is not covered under HICAPS, you may need to pay the fee in full and claim back from your health fund. We can also provide you with the relevant item numbers for treatment required prior to the day of service, allowing you to check with your health fund in advance exactly what will be covered. Comfy Dental operate under a strict cleanliness and sterilisation protocol and our disinfection techniques are designed to ensure patient safety. We have a specialised sterilisation area and water filtration system to ensure a fresh, individual distilled water source for each patient. One of the most commonly requested procedures today is cosmetic teeth whitening. Our team at Comfy Dental has a passion for cosmetic dentistry and specialises in teeth whitening procedures. We pride ourselves on providing our clients with the brightest smiles in Mandurah. 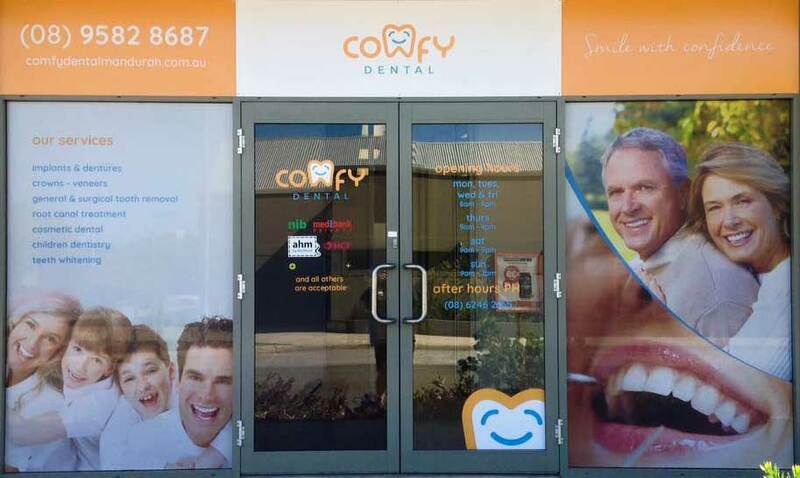 To schedule your complimentary whitening consultation or to learn more about teeth whitening please contact Comfy Dental Mandurah. We see all patients on an appointment basis and ask that you call in advance so that we may reserve time for you. We respect your time and make every effort to remain on schedule. If you are unable to keep an appointment, please notify us immediately. We appreciate 12-hours notice so that this time may be given to another patient. If the dentist recommends a crown, it is likely either to correct a broken tooth or to repair a tooth that has deteriorated due to decay. The decay in your tooth eats away healthy tooth structure much like rust eats away at metal. If not removed, decay will deteriorate the tooth to the point where extraction is the only viable treatment option. Sometimes, decay is removed, leaving healthy tooth structure but not much of it. A crown can then be placed, restoring the look and function of your tooth while allowing you to keep your natural, underlying tooth structure. Most crowns are precision-milled porcelain and are individually customised for each application in each patient, giving you a natural, long-lasting smile. Research shows that fluoride reduces cavities in both children and in adults by halting tooth decay. It also helps repair the early stages of tooth decay even before the decay becomes visible. contained in toothpaste or in mouthwash. I know I have a cavity, but nothing is bothering me, so why should I fill it? The best way to protect your smile is by preventing problems before they start. While you may not experience any troubling symptoms as a result of a cavity, The Dentist strongly suggests filling the cavity as a preventative measure against further decay. Once a cavity has formed, the decay can easily worsen, leading to painful symptoms, including tooth sensitivity or pain, while increasing the need for more complex dental procedures including a crown, root canal, or even tooth extraction. Most people want to have a nice smile since it is the first thing others notice about you. You may be interested in a few minor adjustments, or you may have concerns that need more attention. Some smiles can be enhanced with simple whitening or bonding treatments. Other smiles need porcelain veneers, crowns, or bridges; gum contouring; periodontal therapy; or, a combination of all these techniques. The Dentist will suggest a treatment plan for you based on your goals, your areas of concern, and the overall condition of your oral health. By replacing missing teeth either with a bridge or an implant, you will alleviate the problems associated with missing a tooth and will restore your smile to its beautiful, full appearance. A bridge is one solution for replacing a tooth. By using neighbouring teeth as the supportive structure, The Dentist places a porcelain restoration into the vacant space, restoring the functionality and look of your smile. A dental implant is also an excellent solution. Dental implants involve the placement of a titanium post directly into the jawbone. Once the post has bonded to the bone, it can act as a new, solid support for a natural looking, porcelain restoration. Implants can replace a single tooth or an entire set of teeth, offering more function and permanence than traditional dentures. During your first appointment, your overall dental and oral health will be assessed with a comprehensive oral evaluation. Upon completion of your new patient form, we will ask you to tell us your goals regarding your smile, teeth, and gums. Digital photos and X-rays will be taken of your teeth to identify areas of decay, cracked teeth, and malfunctioning restorations. Our goal is to preserve as many of your teeth as possible by catching decay in its earliest stages. We will also assess your gums and recommend the appropriate hygiene treatment for you.